Not only is today Halloween, but it’s also National Caramel Apple Day. Not only is today Halloween, but it’s also National Caramel Apple Day. So even if you reject the trick-or-treating tradition, you still have a great excuse to eat something sweet. Here, a spectacular recipe for homemade caramel apples plus more recipes that showcase the delicious flavor duo. Lady apples are tiny—about two inches in diameter. They’re the perfect size for fall party desserts. These layered desserts can be served individually or the recipe can be assembled in one large glass bowl. Swirling caramelized apples and dulce de leche into vanilla ice cream is an easy way to make a terrific dessert. 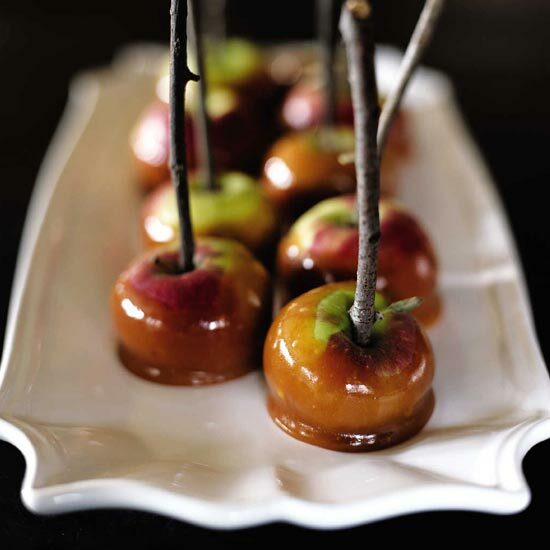 These chewy snacks are like caramel apples in candy form, combining the tangy-sweet flavor of cider with buttery caramel. Chilled ricotta served over warm apples, then drizzled with caramel is an amazingly fast dessert. This deluxe deep-dish apple tart is filled with a layer of pureed apples and caramel-coated apple slices.